This special issue of Aphasiology brings together papers from six countries in three continents on the ways in which computers are being used in the domain. 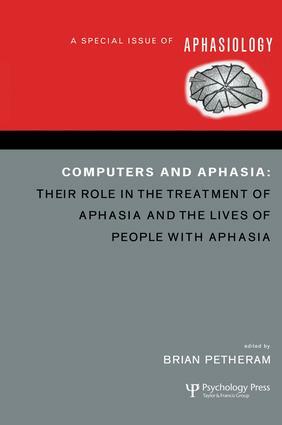 Information technology is now well established as a means of delivering treatment to people with aphasia and this issue includes papers which describe the latest ways in which this is being carried out. Doesborgh et. al. report on Multicue, a way in which the capabilities of computers are used to support cueing approaches to the treatment of naming difficulties; and Mortley et. al. use the internet as a means of delivering innovative treatment approaches to the client at home. It is important that the high tech glamour of the technology does not obscure the need to critically evaluate the contribution of this mode of treatment. Two papers, Wallesch & Johanssen-Horbach, and Wertz & Katz, review and critique the outcomes and effectiveness of computer mediated therapy. In the 21st century computers are increasingly a part of everyday life and two papers address ways in which people with aphasia may benefit from this and engage in the emerging "information society", Van de Sandt-Koenderman looks at ways in which the technology can be used to support communication in day to day life by the provision of appropriate communication aids. Egan et. al. report on training people with aphasia to access the internet on their own account so that they may fully engage with this resource as active citizens. 'The publication seems timely given a increase in the number of aphasic individuals seen in clinic who already have considerable experience in the use of computers in their professional and/or private lives. It provides a very interesting read for those who are considering the use of computers in the delivery of therapy to their clients with aphasia.' William van Steenbrugge, Flinders University, Australia. In Aphasiology 20, 2006. S., M. van de Sandt, D. Frans van Harskamp, P. Koudstaal, E. Visch-Brink, Cues on Request: The Efficacy of Multicue, a Computer Program for Word Finding Therapy. J. Mortley, J. Wade, P. Enderby, Superhighway to Promoting a Client-therapist Partnership? Using the Internet to Deliver Word-retrieval Computer Therapy, Monitored Remotely with Minimal Speech and Language Therapy Input. C.W. Wallesch, H. Johannsen-Horbach, Computers in Aphasia Therapy - Effects and Side-effects. R.T. Wertz, R. Katz, Outcomes of Computer-Provided Treatment for Aphasia. M. van de Sandt, High- tech AAC and Aphasia: Widening Horizons? J. Egan, L. Worrall, D. Oxenham, Accessible Internet Training Package Helps People with Aphasia Cross the Digital Divide.